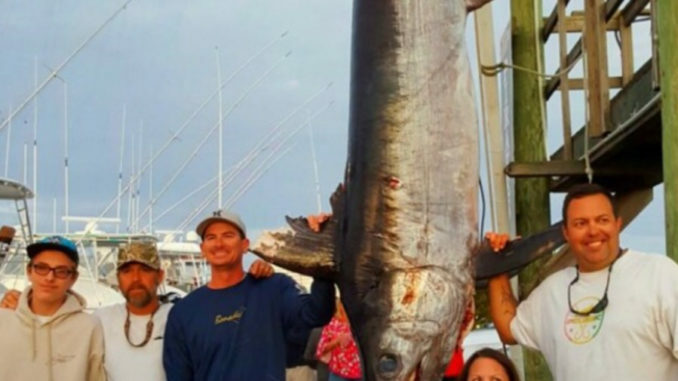 Ryan Keany of Manteo and his crew aboard Horseplay out of Pirate’s Cove Marina boated this 528-pound swordfish on Oct. 14 in 180 fathoms of water north of Oregon Inlet. Ryan Keany of Manteo was sort of planning on fishing for white marlin when he left the dock on Oct. 14, heading offshore out of Oregon Inlet, but he’d also heard talk that Hurricane Michael had blown all of those popular billfish out of the area. He decided to target swordfish, however, and that turned into a capital decision. That day, fishing in 180 fathoms of water north of Oregon Inlet, Keany won a 2 1/2-hour battle with a swordfish that bettered the North Carolina state record by 87 pounds. 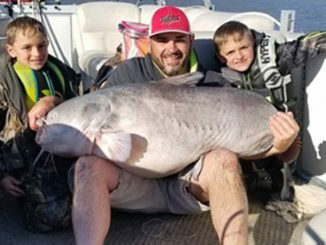 But because Keany was using an electric reel, the 528-pound, 105-inch fish won’t be eligible for record status; it was a stunning catch nonetheless. Keany was fishing on his father’s boat, Horseplay, which he keeps at Pirate’s Cove Marina on the causeway between Manteo and Nags Head. “We had planned to fish for white marlin, but after (Hurricane) Michael came through, they were really gone,” Keany said. “There were no white marlin caught that Saturday, so we decided to go after swordfish on Sunday. 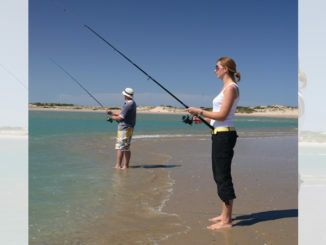 Keany was fishing on an 18-inch Hogy Eel on a two-hook bottom rig, with a squid tube on top and a rubber skirt around the bait to give it more appeal when it bounced off the bottom. The swordfish struck, and there was no doubt about the bite. Keany was on the rod, and two hours and 35 minutes later, he had the fish at the side of the boat, where it was harpooned and hit with the flying gaff before it came aboard. Back at Pirates’ Cove, Keany and his crew got a 528-pound weight on the marina’s digital scales. They measured the fish, which was 105 inches from the lower jaw to the tail, and was 61 inches in girth. North Carolina’s state-record swordfish is a 441-pound specimen caught in 1979 off Wrightsville Beach by J. Horace Murray. 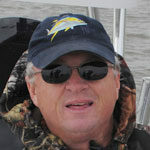 Dan Kibler is managing editor of Carolina Sportsman magazine. If every fish were a redfish and every big-game animal a wild turkey, he wouldn’t ever complain.